Behind the scene of the Alexandria Gazette’s story on Ellen Carter-Goods dated September 12, 2018. Ellen Elizabeth Carter was born on September 21, 1907 in her parents’ home at 614 South Washington Street. Her parents were Douglas Robinson Carter and Elizabeth Campbell. By 1910, the family had moved to 603 South St. Asaph Street. In 1916, the family was living at 821 Gibbon Street. Her father was a skilled carpenter, his occupation was listed in the City Directory as a contractor/builder. He built his own house at 911 Princess Street between the years of 1916-1917. The family was living at the house in 1918. Ellen was the oldest of ten siblings, only seven lived until adulthood. Between Ellen and her youngest sibling, Alfred Dubois Carter, there was a twenty-year gap. She taught several of her siblings, especially her youngest brother, Alfred. He was in her class at Parker-Gray School. During the early 20th Century, many women stayed home until they married. Ellen was one of those women. She stayed home until she married Moses Goods, Sr. Also Moses Goods was living at home with his mother in Washington, D.C., when he married Ellen on June 7, 1937. They were married at Roberts Chapel Methodist Church. For their honeymoon, Moses and Ellen went on a cruise. 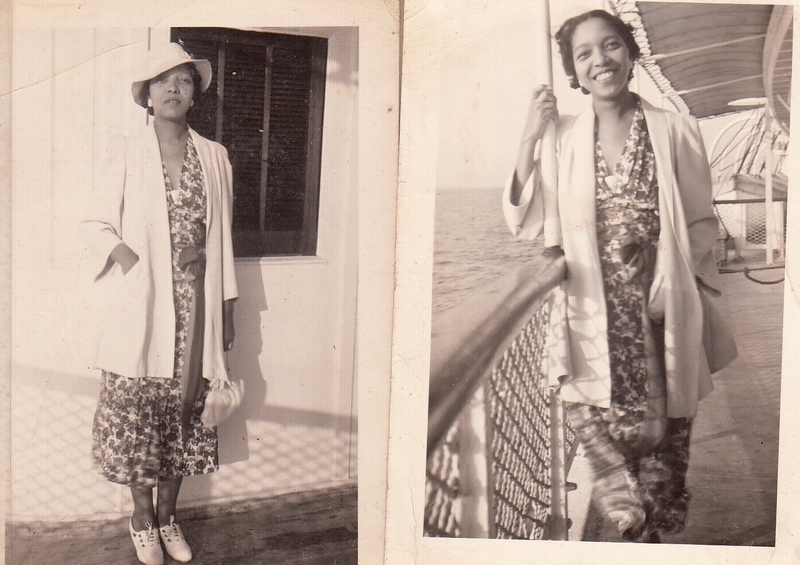 The picture with this blog shows the thirty-year old Ellen on the ship. Although Ellen’s parents were Methodist, Ellen converted to Catholicism. She was a member of St. Joseph’s Catholic Church. After Ellen and Moses’ honeymoon, they moved to 318 Hopkins Court in Alexandria, VA. After sometime, they moved temporarily to 2719 Sherman Avenue, NW, Washington, DC. In 1950, they moved to 2460 South Lowell Street, Arlington, VA and finally to 420 East Custis Avenue, Alexandria, VA.
You can check out the article, ‘A Special Teacher’ in the Alexandria Gazette Newspaper on pages 12 and 30 at http://connectionarchives.com/PDF/2018/091218/Alexandria.pdf. This entry was posted in Black People of Alexandria, Education, Hallowell, Parker-Gray School and tagged Alexandria School Teacher, Charles Houston Elementary School, Ellen Carter-Goods, Parker-Gray School, St. Joseph's Church. Bookmark the permalink. Char, thanks for this excellent story of Mrs. Good! She was a kind, wonderful lady of substance! I was a few grades ahead of her children Elizabeth and Todd at St. Joseph’s Catholic School.